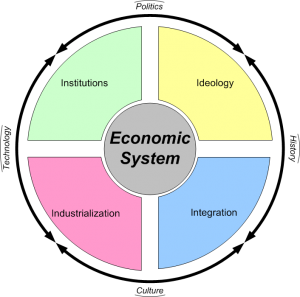 Let’s go back and take another look at our model of economic systems as shown in the diagram here. Although economic growth and increases in living standards have happened throughout human history, the really dramatic changes, the growth that truly transformed human life, doubled life expectancy, and made our modern world is a result of industrialization. It is the consequence of the industrial revolution (for our purposes, we can include the mechanized agricultural revolution as part of the industrial revolution). This industrial revolution is the consequence of changes in culture and technology. In Northern and Western Europe, a unique mix of change in culture (Renaissance, Reformation, and the Enlightenment) combined with discovery of new technology to trigger a revolution in how work was done, how goods were produced, and how economic activity was organized. 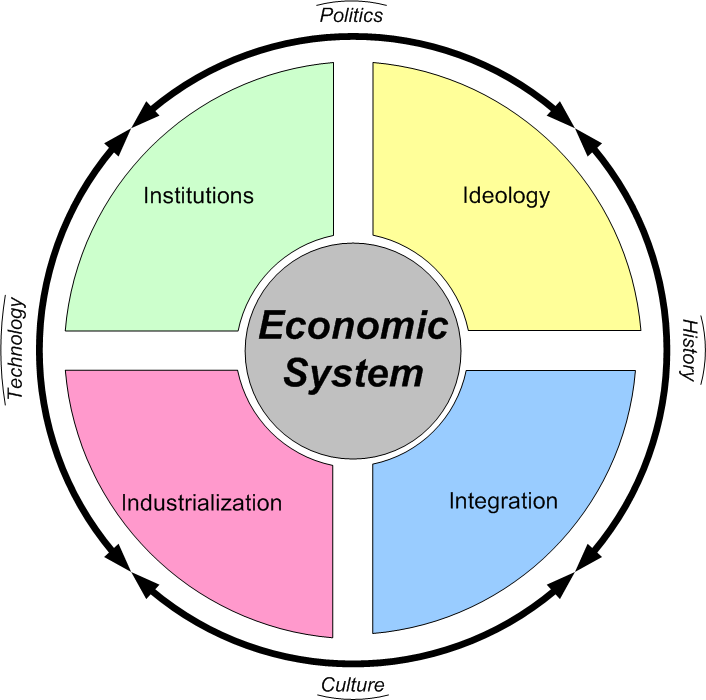 In our model, think of a unique mix of the outside forces Technology and Culture triggering a revolution in the lower right corner, the “Industrialization” aspect of the economy (the red corner). Other countries in history had new technologies, and other countries had receptive cultures, but the right spark, the right combination happened in Northern and Western Europe. In the last Unit, our focus was on the “first world”, the developed and fully industrialized countries. The so-called “first world”, of course, consists of those countries that are most heavily industrialized, richest, and most developed. These include the United States, Canada, United Kingdom, France, Germany, Italy, Japan, Australia, and most all of Western and Northern Europe. These are the countries that experienced the Industrial Revolution first. In the last unit, we saw that the story of these nations in the 20th and early 21st century was largely about struggles over ideology. The reason ideology was the focus of these nations in the 20th century can be understood from our model. Essentially, (think back to your readings in Maddison), these nations had already struggled with and experienced rapid industrialization, a revolution in the red part of the model, before the 20th century. So the Industrial Revolution starts in the lower left (red) corner of the model, but the revolution, the change, spreads. Soon an Industrial Revolution, a revolution in how goods are produced and economic activity is organized, necessitates revolutionary changes in both Institutions and Integration. Let’s briefly look at the kinds of institutional and integration changes that came about in these “first world” countries during this period. New institutions developed. Not only were corporations and large companies organized, but the very concept of a “corporation” as some distinct legal entity was created. Governance and the objectives of the government changed. All of these “first world” nations experienced a revolution in government during this period, some more than one. The US, Canada, and Australia were created from former colonies. Japan and western Europe experienced political revolutions and changes in regimes (not all were violent). Absolute monarchy gave way to elected governments. Even Britain, arguably the most stable and least revolutionary of theses countries, transformed from a monarchy ruling with the sanction of a land-owning class to a limited monarchy led by a popularly elected parliament in less than a century. Banks, paper money, contract law, stock exchanges, and civil courts for economic disputes all developed, indeed were created, in parallel with the industrial revolution. Eventually the combination of increasing industrialization and more complex financial systems created capitalism in the mid-1800’s. At the same time as these Industrial and Political-Institutional revolutions were happening, these same “first world” nations were pushing for more trade, more resources, and expanded markets. They developed global empires. They began to economically integrate different parts of the world. Gradually, each country became less and less of a completely independent, stand-alone economy, and more of a piece of a larger global economy. Trade grew in importance. Very little of this increased integration was planned, just like the changes in institutions were not really planned. Change, particularly political and institutional change, happens as a result of responses to immediate crises. Rarely is it the result of design or plan. Indeed, the Communist Revolution in Russia is 1917 is notable for being one of the very few attempts at planned change. As industrialization grew and developed in the soon-to-be “first world” countries, so did the need for greater trade and integration. Originally, such trade was seen in terms of “empire”: a parent nation would expand its economy to include exclusive access to various colonies and conquered or subjugated lands. So in terms of our model, the “first world” countries were experiencing more than a century of rapid changes, originally in industrialization, but soon also in institutions and integration. Most of the change was haphazard, unplanned, and unpredictable. The changes brought many very desirable outcomes: better living standards, wealth, increased democracy, more widespread literacy and education, longer lifespans, lessened power of monarchs and tyrants, new products, and new opportunities. But the changes also brought fearful, undesirable and poorly understood phenomena: urban poverty, unemployment, periodic financial crises, uncertainty, horrific total warfare, and a new powerful class of people called capitalists. By the early 20th century, constant change in industry, institutions, and integration appeared to be normal. Change was considered “normal”. But the path was not clear. It wasn’t clear where all these changes were leading. Was it progress leading to utopia? Or was it the road to doom and destruction for the average person? It was clear the role of government had changed. Government was now clearly supposed to be the representative of “the people” (20th century idea) and no longer “God’s representative on earth” (the 18th century view). But it was unclear exactly what that meant. By 1914, the revolution had spread from industrialization through institutions and integration and now converged on the issue of ideology. Essentially, it was time for the first world nations in the 20th century to try to make sense of the changes that had been happening to them. The conflicts, arguments, and focus was on ideology: What should the economic system be like? What should the government’s role be? What should the institutions be? In other words, industrialized nations spent the 20th century not only growing, but also fighting (often violently) about just what is the most effective, most desirable economic system. Of course, the simplistic explanation of the 20th century claimed there were only two competing ideologies: communism/socialism vs. capitalism. Of course, in fact, there were (and are) many gradations and variations. There’s concentrated, privately owned but publicly directed capitalism such as characterized Nazi Germany and Fascist Italy. There’s centrally planned, government ownership of means of production Communism of the old Soviet Union (post 1928). There’s the social welfare state, government ownership of big industries but with market competition of mid-century Britain. There’s the monopolistic competition with the US with more or less Keynesian management of macro conditions. Nonetheless, people began to group countries into 3 categories: first, second, and third worlds. The “first world”, of course, was the industrialized countries that we have been discussing. What these countries had in common was that they were heavily industrialized (generally) and had some variation of an economy with markets and capitalism in it. The “second world” consisted of the Communist (or at least USSR-aligned) countries. Sometimes the “second world” was industrialized (think Russia, Poland, Hungary), sometimes not. Usually, though, if countries in the “second world” were industrialized, they had come to it by a different history or path than Northern/Western Europe or Japan had. During the “golden age” of 1950-1973, it appeared that the clear winner was a heavily Keynesian-managed, capitalist economy featuring competitive markets but with a social-safety net and a regulated banking sector. The centrally planned model of the USSR appeared to be an alternative based upon the rapid growth and industrialization it produced in the mid-century. But by the 1980’s, the scene was changing. Intellectually, the western “first world” countries came under the influence of an intellectual revolution that promoted a vision of unregulated “free” markets and unfettered big-business capitalism producing widespread wealth and freedom for all. Keynesian macroeconomic management, banking regulation, enforcement of laws promoting competition (anti-trust laws), and market regulation declined. The more significant change happened in the so-called “second world”. Remember that before the 1980’s, the term “second world” was just another word for the “communist bloc”: the communist countries aligned with the Soviet Union. But by 1980 cracks in the communist “bloc” were showing. Growth had stagnated in the USSR and throughout the Communist world. China had politically split from the Soviet Union in the 1970’s and in 1978 began to open itself to market reforms. By the early 1980’s a political-economic revolution had started with a labor union in Poland’s shipyards that would eventually topple communism in central-eastern Europe. By 1989 the Berlin Wall was torn down. By 1991, the USSR itself imploded. Except for Cuba and North Korea, the Communist world had disappeared. Intellectually, it appeared that the questions of “ideology” were settled. (think of how the video Commanding Heights describes these issues). It appeared that “deregulated, free-market, free-trade capitalism” had won the battle of ideologies. Discussions of “economic systems” shifted. No longer was ideology the topic. By the 1990’s, world leaders didn’t talk about ideology so much. Instead, the topic became “industrialization and transition to a market economy”. What had once been called the “second world” now became “emerging or developing markets”. Instead of the second grouping of countries being defined as those with a communist system, it became those countries that were neither poor/underdeveloped nor fully developed/industrialized economies. New terminology emerged. These countries were called “emerging or developing markets”. Most all of the nations that had been communist (or their successors) are in this group: Russia, Poland, Hungary, Romania, China. But as this grouping of “emerging market” economies has grown to include others also. It now includes, Brazil, India, Turkey, South Africa, and others. These are countries that are at least partly industrialized, often growing rapidly, and clearly have the potential to someday become “fully developed” and join the “first world”.